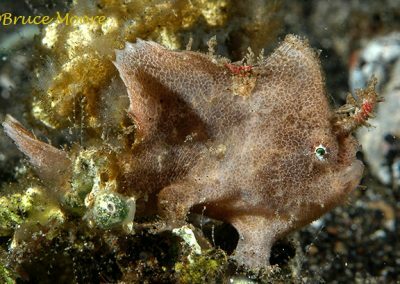 The "New" Lembeh Frogfish - Black Sand Dive Resort - Lembeh Strait, North Sulawesi - Indonesia. 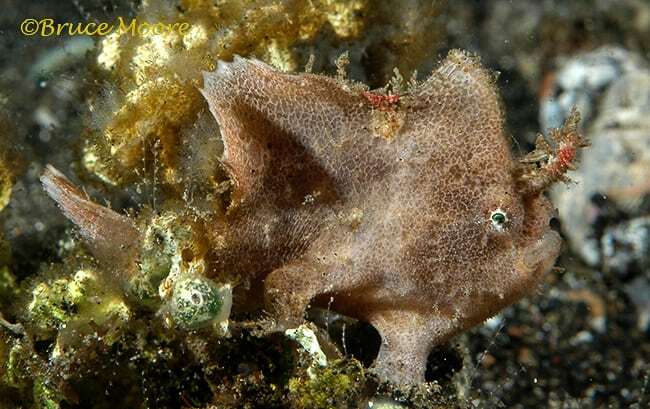 It is no secret the Lembeh Strait is the Frogfish Capital of Planet Earth. 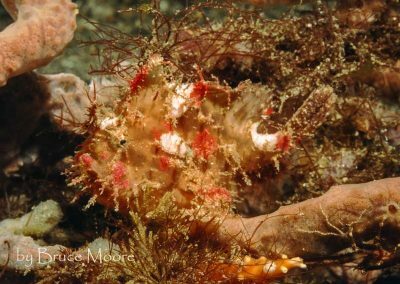 We really love our frogfish. Correctly identifying the numerous species we encounter can be challenging since some species look very alike, causing confusion. Antennatus nummifer (Spotfin Frogfish) and A. coccineus (Scarlet Frogfish) are the worst offenders. 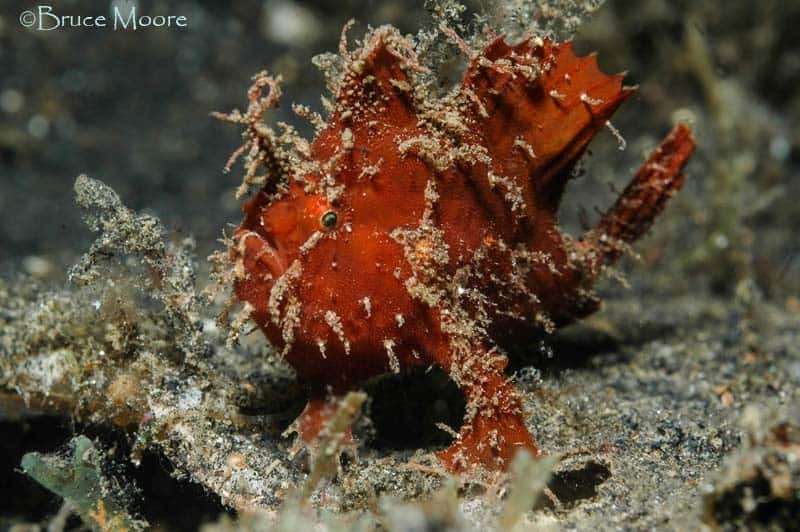 But just a name can cause consternation, which brings me to the Lembeh Frogfish. 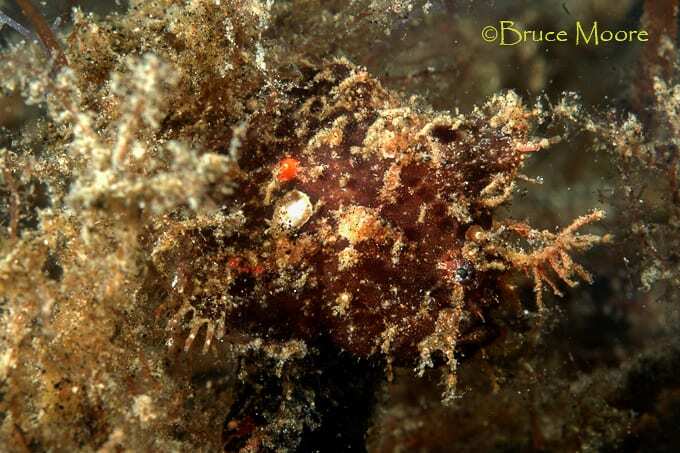 Last year I received word that the Ocellated Frogfish has been officially described. 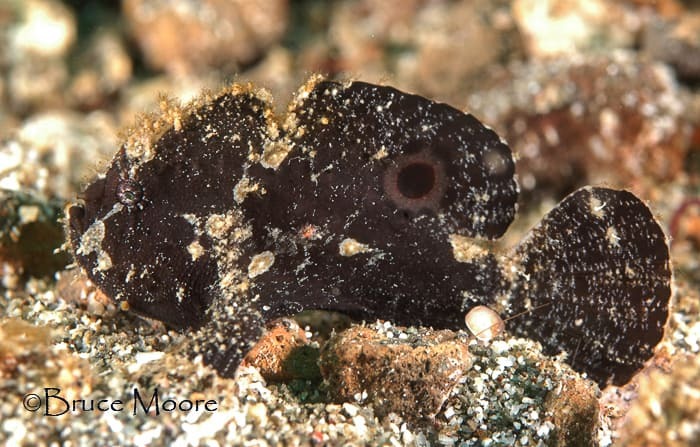 The new name is Lembeh Frogfish / Nudiantennarius subteres. 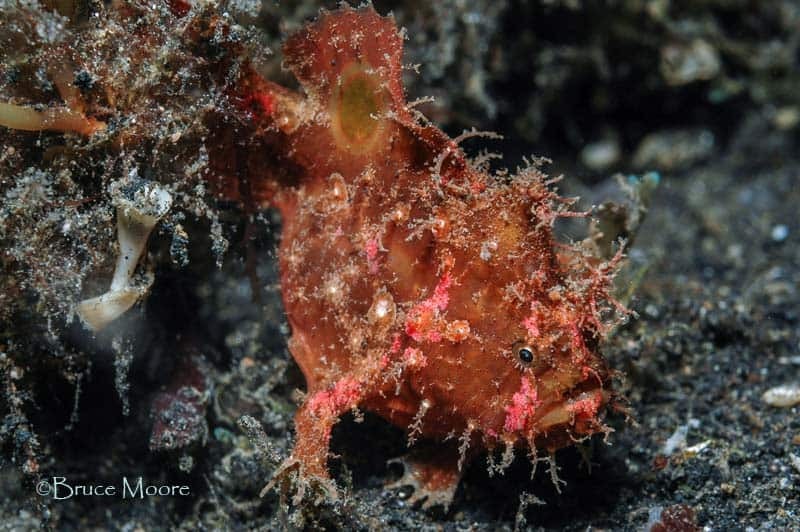 But we already had what we called (unofficially) the Lembeh Frogfish, otherwise known as the Shaggy Frogfish. Some confusion is understandable. 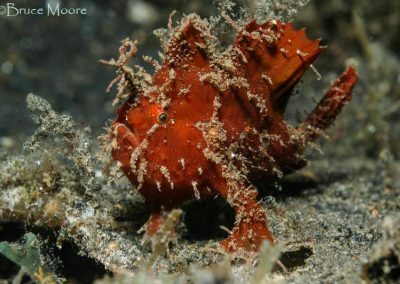 In fairness, Teresa Zubi has always called the Ocellated frogfish the Lembeh Frogfish on her expansive and comprehensive web site www.frogfish.ch , which is very recommended to check out if you are into frogfish. So perhaps she had some influence with the name. 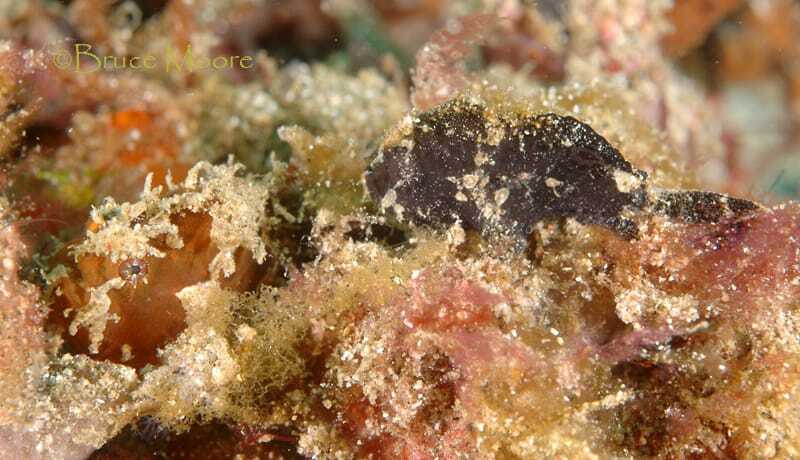 It is a very small frogfish and the main identifying feature is the orange / yellow / pale “O” eyespot (Ocellus) on the dorsal fin. Sometimes there is two on one side and only one on the other! Even three ocelli have been seen. I thought that we were finding them only in black until tan-coloured ones were seen from time to time. In the new description it seems that another identifying feature is the long “toes” and a prominent “fishing rod” (second dorsal spine). Using this description, I have attached the name to two rather different-looking specimens (below). Another feature (sometimes) is the presence of white skin shreds along the edge of the tail (look closely on the far bottom snapshot). 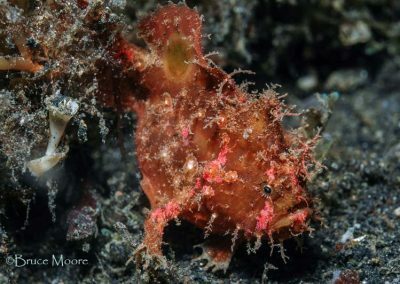 So now we must endeavor to apply this new name of Nudiantennarius subteres / Lembeh Frogfish and hopefully it will lead to more accurate identification of the myriad and messy variations within the numerous frogfish species we find in the strait.